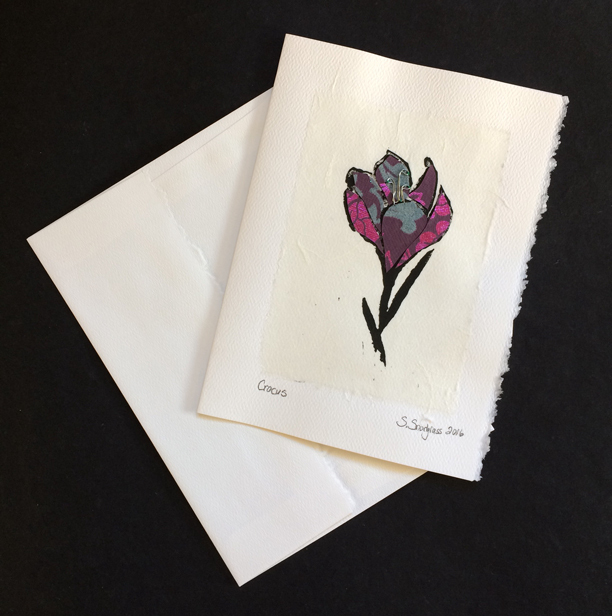 Cards and matching envelopes: white, acid-free watercolor paper with deckle edge on card and envelope flap. For each of these card designs, I begin with a drawing that I transfer to and carve into a linoleum block. From that block, I create a print on textured paper. I then add cut paper shapes and sew-on wire elements that I bend in ways that I feel reinforce the movement or form of the image. All of those elements are joined together on a watercolor paper card stock. Each is individually hand-crafted and intended for use as a card or may be framed and enjoyed as artwork. My cards may be purchased in Maine at Abacus and Freeport Yoga Company ; or directly from me. My Holiday Cards, of course, are only available seasonally.